Goaltender Ryan Dugas stopped all 27 shots he faced in his OHL debut, becoming the first Fronts rookie to record a shutout since 2004-05. 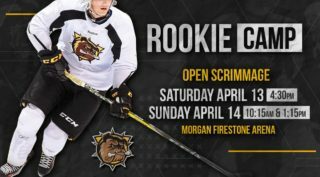 Dugas helped Kingston blank the Erie Otters 4-0 on the road as fellow rookie teammate Dennis Golovatchev had a goal and an assist. 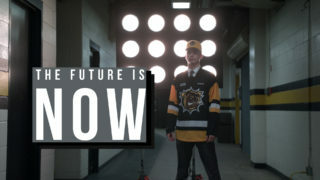 Dugas was part of the 2017 OHL Cup champion Mississauga Reps before becoming a fourth round pick of the Frontenacs in the OHL Priority Selection. The Hamilton, Ont. native spent last season with the GOJHL’s Ancaster Avalanche, posting a 2.01 GAA and a .931 SV% in 30 games. Dugas’ former Mississauga Reps teammate, Dennis Golovatchev scored his first OHL goal in Saturday’s 4-0 Kingston Frontenacs road win in Erie. Golovatchev took advantage of an opportunity after an Otters defenceman blew a tire, opening up an open net for the 17-year-old winger who made no mistake. 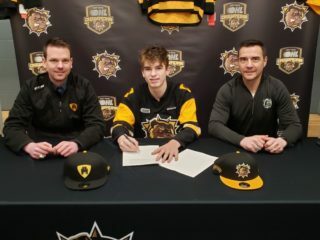 Golovatchev also added an assist in the victory, rewarding the Frontenacs who recently acquired him from the Guelph Storm. Golovatchev scored the game winning goal of the 2017 OHL Cup, helping the Reps hoist the trophy for the first time. 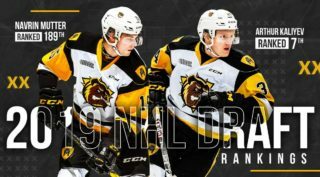 He was Guelph’s third round pick in 2017. Tim Fleischer tipped a Kade Landry wrist shot past Peterborough’s Hunter Jones to open the scoring in a 7-1 Hamilton Bulldogs road win over the Peterborough Petes. Celebrating his 18th birthday, Fleischer tallied in his third career contest after being Hamilton’s second round pick in the 2018 CHL Import Draft. A native of Iserlohn, Germany, Fleischer spent last season with Jungadler Mannheim’s U19 squad, posting 48 points (13-35–48) in 21 games. Cullen McLean scored 6:01 into the first period, netting the lone goal in a 2-1 Soo Greyhounds overtime loss to the Sarnia Sting. The Ajax-Pickering Raiders graduate snapped a wrister past Sarnia’s Ethan Langevin from down the right wing with assists from Tye Kartye and Holden Wale. A former 15th round pick by the Greyhounds in 2017, McLean found the back of the net in his fourth career contest.